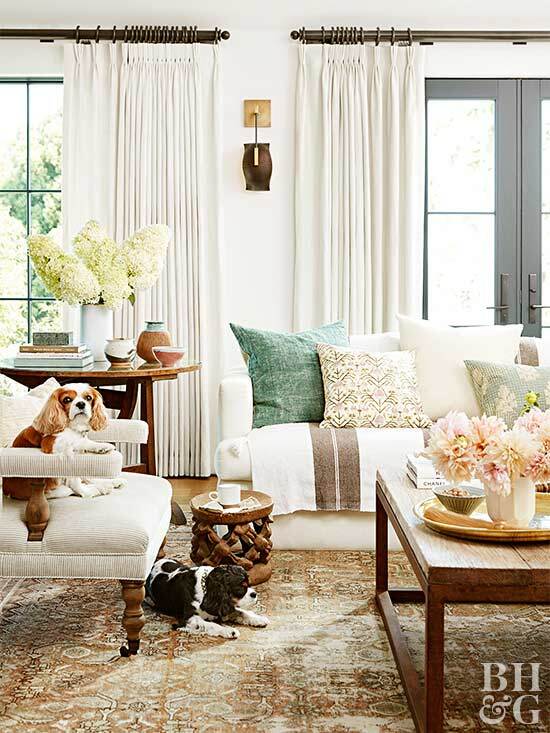 This is a home tour I stumbled upon on the Better Homes & Gardens' site a few months ago and fell in love with it. It's actually the Los Angeles home of Dancing with the Stars alumni Julianne Hough, who I must admit, I'm somewhat unfamiliar with. I've never seen that show. Or American Idol. Or Harry Potter. Or Star Wars. I guess I just don't have time, what with my hectic schedule of playing with my label-maker and sitting around doing nothing. But what I do know about Julianne is that she has a house I really love. Her kitchen, in particular, is perfection. The Parisian bistro chairs and sliding library ladder in the kitchen provide just the right amount of whimsy, but overall, the feel of the same is earthy and comfortable. Interior designer Jake Arnold did such an incredible job at finding pieces that would layer so perfectly. By leaving the glass cabinets backless, they have the illusion of floating. The library ladder is perfect for reaching the second row of cabinetry. The toned-down colour palette chosen for the space was purposefully designed to be the antidote to Juliane’s busy life as a dancer and dancer. "Muted, earthy greens, browns, blues, and some yellows feel grounded and protective," she says. "But I also love pops of colour. They symbolize pure joy." The fabrics used throughout the space are all easily-cleaned to accommodate for the pooches. Apparently, as a child Julianne used to regularly rearrange the furniture in her bedroom, and has been doing it ever since. So likely are her chances of changing things around, her interior designer Jake Arnold specifically chose pieces for the house that could be easily moved around and would fit anywhere. "I'll browse a furniture store over a clothing store any day. I appreciate a vase, chair, or table for how much effort went into making it," snaps to that, Julianne! The pair of shearling-covered chairs add a quirky, modern touch to this otherwise rustic bedroom design. I love how the variation of textures keeps the space from looking bland, despite it being almost all shades of magnolia. "I like it when you can't tell an object's age, when you don't know whether it's brand-new or a century old. Rather than buying on trend, Jake and I were both attracted to things that felt timeless," Juliane concludes.